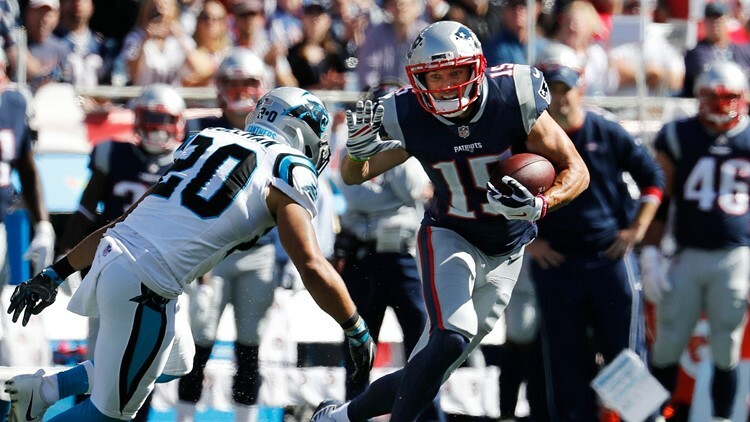 New England Patriots quarterback Tom Brady tries to get past Carolina Panthers free safety Kurt Coleman during an NFL football game at Gillette Stadium in Foxborough, Mass. Sunday, Oct. 1, 2017. The 30-year-old during his three seasons in Foxboro helped New England win two Super Bowls. FOXBORO, Mass. — Patriots wide receiver Chris Hogan, who in his three seasons helped New England win two Super Bowls, is moving south. The Panthers on Friday announced the 30-year-old, an unrestricted free agent, had signed a one-year contract with Carolina. Over the last three years, regular season and playoffs combined, Hogan caught 141 passes for 2,193 yards and 16 touchdowns from future Hall of Fame quarterback Tom Brady. He'll now catch passes from 2015 league MVP Cam Newton, a three-time Pro Bowler and former Heisman Trophy winner, and play alongside receivers D.J. Moore, Torrey Smith, Curtis Samuel, Jarius Wright and tight end Greg Olsen. Prior to Foxboro, Hogan spent three full seasons in Buffalo, making this the first time he'll see NFL action as a non-member of the AFC East. According to the Panthers, Hogan tied DeSean Jackson in 2016 with a league-leading 17.9 years per reception. Since that season, he ranks second in the NFL with 542 postseason receiving yards and is tied for first with four touchdown catches.